This application will be heard at the Board of Commissioners meeting on Tuesday (9/27) 6:30 pm at the Maloof Building. Last Thursday, Commissioner Kathy Gannon invited several local leaders to discuss the townhomes proposed for Lawrenceville Highway between Orion and Hollywood Drives. The attendees were: the board of the Greater Valley Brook Civic Association (Erik Spalvins, Kenna Simmons, Jack Barnes, Kimberly Merritt and Elizabeth Roberts), Jim Smith (Dekalb Cross Neighborhood Council), Susan Rossi (Community Council Representative), Jane Donofrio (president of the Little Creek Farm Conservancy) and Mike Cooper (Representative of Little Creek Farm Conservancy) , Davis Fox (Policy and Projects Manager for Commissioner Gannon), and staff of the Dekalb County Planning Department. We discussed the townhome proposal's merits, the concerns of residents and the concerns of the Conservancy board. The view of the County is that the townhome proposal is a "down zoning" - it is a less intense use of the property than could be allowed under the current zoning. According to County Staff, the zoning would allow up to 18 units per acre whereas this development is less than 11 units per acre. Commissioner Gannon said she would like to revise the conditions drafted by the developer, the board of the Greater Valley Brook Civic Association and the County Staff. The revision by Commissioner Gannon's office is below for your review. Please let me know if you have comments. If you prefer, you should always feel free to communicate them to Susan Rossi, Commissioner Gannon's office, or Commissioner Barnes-Sutton's office. We are still working on potential improvements to the intersection of Orion and Lawrenceville Hwy and to the public use areas of the Little Creek Park, however the off-site improvements cannot be a part of the conditions for the zoning. I will provide updates as they are available. 1. 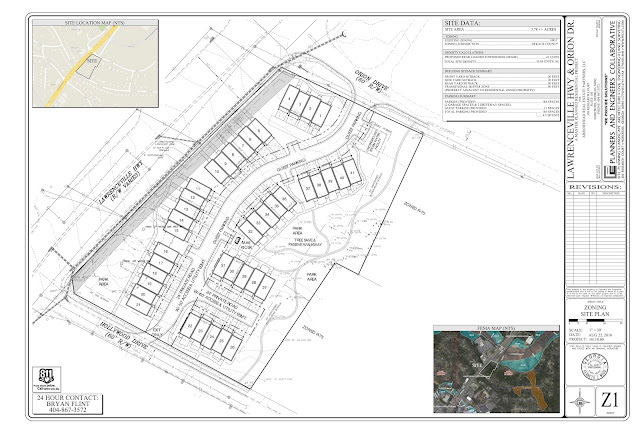 The subject property shall be developed for no more than 41 fee simple townhomes, in substantial compliance with the layout shown on the site plan titled “Lawrenceville Hwy & Orion Dr.”, prepared by Planners and Engineers Collaborative, dated August 22, 2016 and attached as Exhibit A; and in substantial compliance with Elevation Plans dated 8/102016 and attached as Exhibit B. Side elevations shall have windows or other architectural features to prevent blank walls. 2. The proposed development shall be consistent with the conceptual landscaping plan titled, “Tree Replacement Plan”, prepared by Planners and Engineers Collaborative, dated August 15, 2016, and attached as Exhibit C subject to approval by the County Arborist and submitted to the Planning and Sustainability Department on August 22, 2016. 3. No vehicular access shall be permitted from Lawrenceville Highway. Access from Orion Drive and Hollywood Road shall be limited to one curb cut subject per street subject to the Transportation Division of the Department of Public Works. 4. Building facades shall have four sided architectural finishes which shall consist of brick, stone, stucco, hardi-plank or man-made equivalents (such as EIFS, architectural split block) or combination of these finishes. 5. A 50-foot transitional buffer adjacent to single-family detached residential zoned property along the southeast property line shall be established by protecting the existing trees and providing additional landscaping to enhance the buffer as approved by the County arborist. Pedestrian paths are permitted in the buffer. 6. All exterior lighting shall be screened from Little Creek Horse farm and adjacent properties, or shielded to minimize glare and keep light inside the development. 7. The townhome units shall not exceed 35 feet in height as measured by DeKalb County Code and shall be a minimum of 1,800 square feet in unit size. 8. The developer shall design, construct, operate and maintain an underground storm water management plan that is in compliance with all applicable laws and regulations. 9. A mandatory homeowners association shall be created and shall be governed by a declaration of covenants, conditions, and restrictions that shall include, among other components, a provision limiting the number of leased units to 10% of the total units. The homeowner association shall be responsible for the maintenance of the transitional buffer, open space within the property, street lighting, amenity areas, pedestrian paths and other common areas within the site. 10. Open space and common areas within the community shall be owned, maintained, and controlled by the mandatory association. The common space areas shall be used primarily for recreational purposes; however, they may also include such features as gazebos, benches, amenity areas, walking trails and two dog walk stations with waste receptacles in common areas. 11. The park areas and pedestrian trails in the buffer shall connect to the sidewalks on Orion Dr. & Hollywood Road and will remain open to public use for the larger community. 12. The sidewalks along Lawrenceville Highway shall be a minimum width of ten feet. A minimum six-foot wide landscape strip shall be located between the edge of pavement or edge of curb of Lawrenceville Highway and the sidewalk. The landscape strip shall be planted with a low hedge to separate pedestrians and cyclist from Lawrenceville Highway subject to GDOT approval. Street trees planted at a minimum of 40 feet on center shall be planted on the southern side of the sidewalks, subject to approval by the County Arborist and the Georgia Department of Transportation. The developer shall take all necessary precautions to protect the two specimen oaks on the southwest corner of the property. These precautions include 6’ metal fencing to protect the root zones from vehicles and the storage of building materials during site development and construction. The sidewalks along Orion and Hollywood shall be a minimum of 5 feet in width. The developer shall dedicate the necessary right-of-way to accommodate these improvements. 14. Construction on the property will occur Monday through Friday from 7:00 a.m. to 7:00p.m. and on Saturdays 8:00 AM to 5:00 PM. Loud music during construction will not be allowed. There will be no construction on Sundays and holidays unless such activity arises from an emergency which places the neighboring or subject property at risk of harm or loss. 15. Construction traffic will have a right-in, left-out access to the property on Orion Drive. 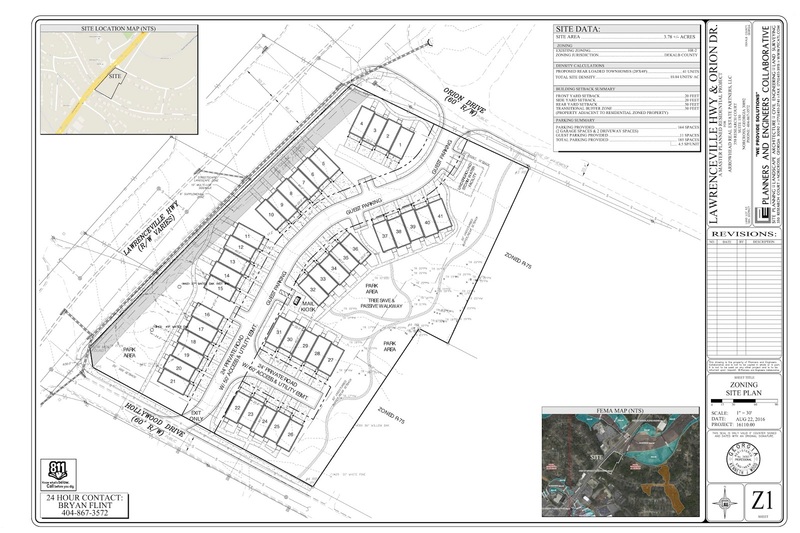 The applicant will inform all construction traffic that they must access Orion Drive from Lawrenceville Highway and shall not travel southeast on Orion Drive into the residential area. 16. All land disturbing activity shall be carried out in accordance with the Georgia Erosion and Sedimentation Act of 1975 and shall contain provisions for application of soil erosion and sedimentation control best measures and practices. In addition, the applicant must also comply with the DeKalb Tree Ordinance and all other best measures and practices required by County, state and federal laws. The best measures and practices shall apply to all features of the site, including street and utility installations, storm water management facilities, drainage facilities and other temporary and permanent improvements. 17. The approval of this rezoning application by the Board of Commissioners has no bearing on other approvals by the Zoning Board of Appeals or other authority, whose decision should be based on the merits of the application before said authority. 18. Final lot layout subject to sketch plat approval in accordance with DeKalb County Ordinances, Chapter 27 (Zoning Code) & Chapter 14 (Land Development Code) before applying for a Land Disturbance Permit (LDP).